Installing hardwood floors is a functional way to add beauty and value to your home. It is not too difficult to install and easily accomplished by most do-it-yourselfers. There are several choices to make as far as type and method of flooring installation. Consider the look that you want to end up with, your budget, and the surface that the floor will rest on before you make a decision. Typically hardwood flooring comes in different widths and grades. There are also various types of wood to consider. Each variety will give a different look to your home. The grain, the final color, and the look will all be different depending on the wood that you choose. Bamboo flooring is a sustainable choice to consider, as is cork. Wood Floors Online has a pictorial guide to help you choose the wood you want. You will also need to decide on the width of the floor panels. Consider the size of the room and the other design components of your home when making that choice. Plank flooring, which tends to be wide, looks better in larger rooms, or in older homes. It works well with a rustic or country look. Strip flooring is narrower, no more than three inches wide, and looks great in a contemporary or cottage setting. Wood is graded according to quality, but you don't necessarily need the best, and therefore most expensive, quality of wood for your floor. The grade you choose will depend on the finished look you want. Clear: Few flaws. Grain is even for the variety. Minimal character marks. Select: Few flaws. Some character marks. Most pieces match. Grain is well defined. No. 1 Common: Light and dark pieces. A few marks and minor flaws. No. 2 Common: Character marks. Worm holes, knots and discoloration. Good for a distressed floor. There is another wood option. Most cities have an architectural salvage company where you can pick up vintage, old growth wood flooring. Old growth wood has a much different look than the wood available today. There is nothing that looks like it, or has the beauty of it. You will have to contend with flaws, scratches, and nail holes. The floor has, after all, been used for years. Some people absolutely love this look. Not only is it a beautiful wood, it is a very eco-friendly option. Unfinished flooring boards haven't been finish sanded, stained, or sealed. The major difficulty when using unfinished wood is that it is prone to swell in moist environments. Try not to do the project during periods of high humidity, rain, or snow. The unfinished flooring will need to acclimate in its new location for at least two days before installation. You can stain, paint, and finish the raw flooring in numerous ways for a custom look. Pre-finished hardwood flooring has been sanded and sealed. It is moisture resistant and won't shrink or swell very much. You install it the same way you do an unfinished floor, guarding against scratching. It is the more expensive of the two options, and the stains and finishes will be limited. 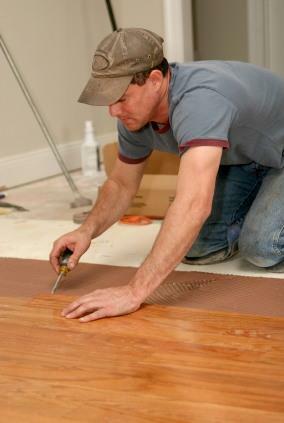 Prefinished flooring is quicker to install because there is no sanding or staining to be done. Remove the baseboards. Mark the location that they came from on the back. Avoid breaking them. Put down a 15 pound builder's felt vapor barrier, overlapping edges by about four inches. Be careful not to tear the material. Glue down the seams with tar mastic. Flooring is most often laid parallel to the longest outside wall. If you can't decide how you want to do it, just dry fit several courses to see how they will look. This way you can change the way it is laid until you get the perfect floor. Lay the longer pieces at doorways when working with random lengths. Weave in short pieces throughout the floor without clustering them together. This will give the best look to your floor. Leave space around the edges of the room to allow for expansion of the wood. This expansion gap will be hidden by the baseboard. It allows the boards to expand and contract without damage. Use a carpenter's stringline to make a straight line against the wall. This is an important step because the wall may not be straight. Slide the first course of flooring up against the line you have made. Drive a nail through the face of the course. It should be placed so that it will be hidden under the baseboard. Angle a nail over the tongue every 10 to 12 inches for strips and 6 to 8 inches for planks. This is called blind nailing and adds stability. Nails should be long enough to penetrate the subfloor by at least one inch. Continue making courses. Tap the following courses into place with scrap wood. Stagger the rows so that the seams are not continuous, but are broken up. Continue to blind nail through the tongue edge of the flooring. A pneumatic floor nailer is a handy tool to use when installing hardwood floors. When you come to the last row, fit it in and pull it tightly with a pry bar. Nail the course at the edge. Make sure that the nail heads will be hidden under the baseboard. If you are using unfinished flooring, then your next step will be finishing the floor. If you have used a finished product, you just need to replace the baseboards and admire your work. Lowe's has great instructions for installing a floating hardwood floor using adhesives. This method will save you the hammering and nailing, but adhesives can often carry high levels of toxicity. You will have to weight the savings in time and work against your feelings about your environment to come to the best decision for you. Whichever method you use, installing hardwood floors is an accomplishment to be proud of.